This is another of Mr. Kauffmans surveys of early metal trades. Dealing with the copper smith and brass founder. He covers everything from the first mines in the colonies. And what was the British laws dealing with the found ore and the smelting of it. It was supposed to be shipped back home and then the sheet metals and goods bought from merchants in England. Needless to say that, that arrangement didn't work well. Along with the growing mining, smelting and foundry business in this country. The turning point was the achievement of rolling the copper sheet sheathings for the ships. Most importantly, was the US Constitution. Paul Revere was to achieve universal fame for this achievement, in the early nineteeth century. His involvement was of a short duration. He then moves on to detail discussions of the Coppersmith, and Brass founder's each has a separate chapter, covering the business, work, and details of general items. The 3rd section of the book deals with the products of the Coppersmith and Brass Founder's. They are divided into main categories, and than further sub-divided into the various types or uses. With the available information, and photo's or drawings of the items. This in some cases has proved difficult with somethings. As they have been scrapped, to make new items. Since all most all had offers to buy old used and damaged items. For the Coppersmiths; Kettles were the main group. With all the possible varitions for the other trade groups that used them in their work. Kettles, cooking, brewing, dyers, fish, hatters, and other types. Pots and pans, warming, sauce, stew, frying, and coffee pots. Stills, since a lot of homes cooked their own. Miscellaneous Objects, Sheathing, butter churns, stencils, mugs, ladles and skimmers, measures, lamp fillers, drip pans, funnels, basins, coal hods, pumps, piping, glue pots,Higley coppers(the first local copper coinage, in the colonies), Weathercocks and engraved plates. Andirons, bells, gun parts and cannon, molds for casting of pewter objects. Miscellaneous objects of cast brass, furniture brasses, door knockers, skillets, tomahawks, lancets, jagging irons,buttons, scientific instruments, steelyards, balances, sundials, lighting devices, clocks, and door locks. In the 5th section the business life, business and his dealing are discussed, since his papers as far as his business of Coppersmithing goes. The last sections 6 and 7 are two documented lists of Coppersmiths and Brass founders. The list includes, their name, residence and date or dates working at the trade. He finishes up with a bibliography and a very detailed index. 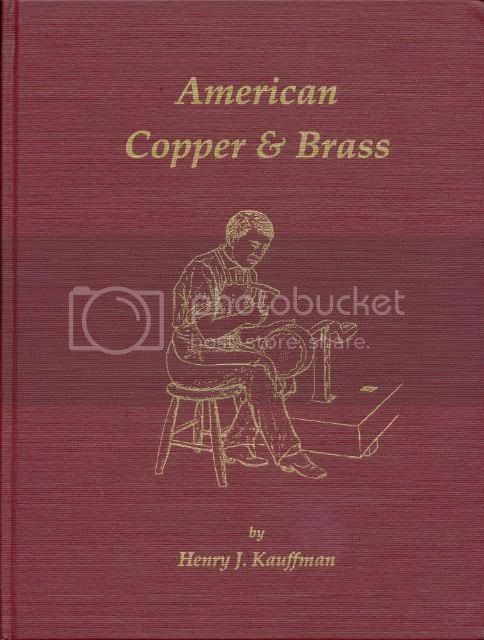 This book along with “The Art of Coppersmithing”, the current available by John Fuller Sr, The Astragal Press , ISBN#1-879335-37-9 My review is in this thread. Will give you a very well rounded idea about and the techniques of the coppersmith.